When the weather starts to cool off a bit down here in Southern Alabama, the Pecans (down here, it is pronounced Puh-Cahn) start to fall. 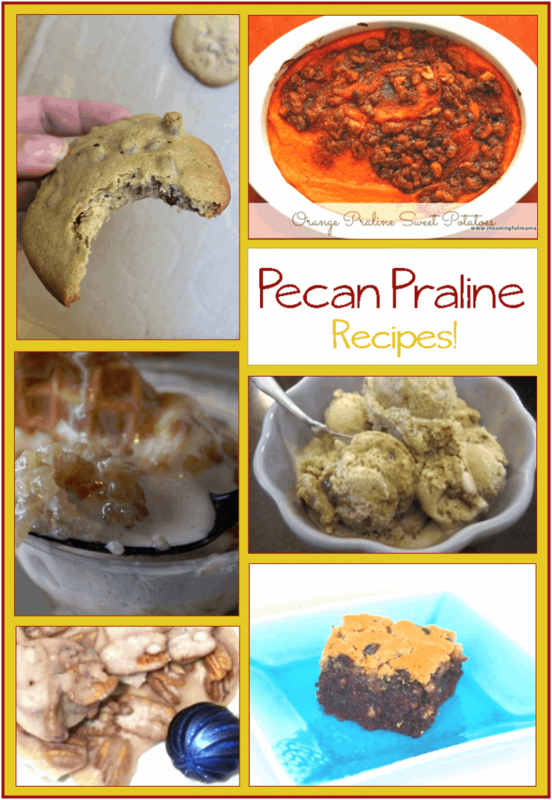 When they fall, it is time to start making some yummy pecan praline recipes (and many other pecan yummy-ness! I can honestly say that I have never had Pecan Praline Ice Cream, but I betcha it is delicious! Just looking at the picture is enough to make me want to go get the necessary ingredients! Do you like rice pudding? If so, I bet you will love this sticky rice, caramel, praline pecan sundae! This Praline Pumpkin Dessert is like the quintessential fall dessert! I don’t think it can get much more seasonally perfect that this, unless you threw some cranberries in. LOL! I guess this one is another super autumn-like dessert… Orange Praline Sweet Potatoes – oh yes please! Have you ever had Praline Cookies? Better than any pecan sandie out there, these have a bit more sweet without losing the crunch – so yum! Looks yummy! Thanks for sharing at #inspirationmonday!